← Angry Democrat Mobs, Foreign Invaders, and – Republican bombs? Democrat’s invite thousands of illegal aliens to invade the USA to overwhelm citizens. They call them “refugees” but since when do refugees invade your country? 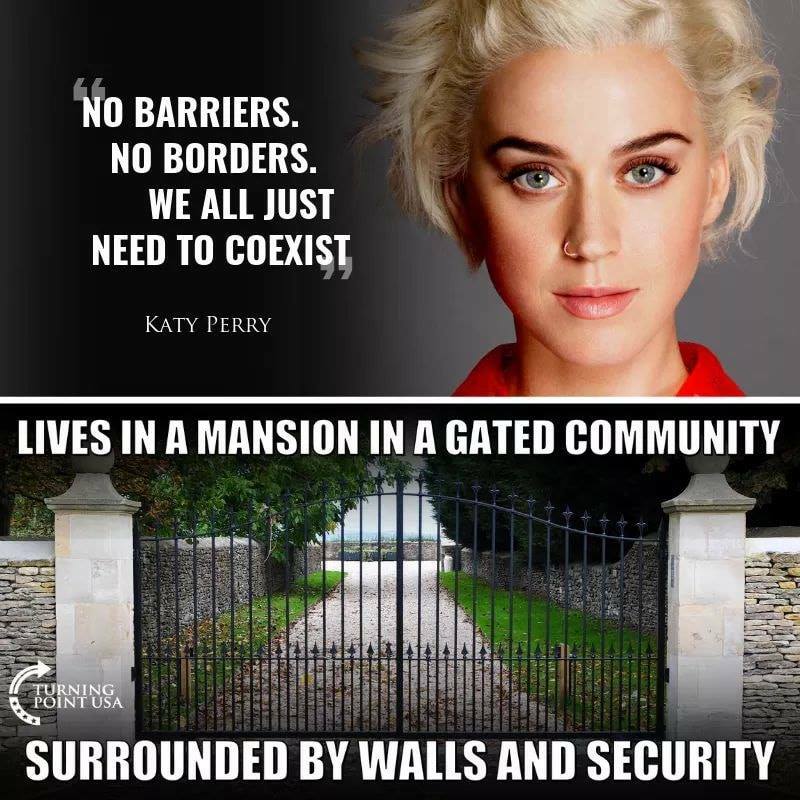 That’s like someone knocking on your door asking for help then busting in your door and making themselves at home expecting you to care for them. That’s not what refugees do. That’s not the act of someone seeking help. That’s the act of an intruding criminal. If they only wanted to escape the wars that Democrats fomented in their countries to create this crisis they would go to a neighbor and seek shelter there. But no. They are bypassing every country they enter to invade the USA even as they burn the American flag and wave the banners of their own countries. America has something between 12-30 million illegal aliens. They are given sanctuary by Democrats. They are given taxpayer benefits while they don’t pay taxes. They are even given the vote by Democrats desperate to retake power over Americans. They are called “Americans” by Democrats who claim anyone born in the continental Americas is a United States citizen because of the name. Only in the USA have the people been called Americans even by people of Central and South America and Canada. Democrats warp the language like they warp the law and warp minds. Democrats want this invading army to enter the United States, so they can damn Trump for “separating families” and being a “racist” for disallowing “brown people” from “freedom.” There is no freedom for these invaders when their freedom is to subvert America into a leftist socialist dictatorship. 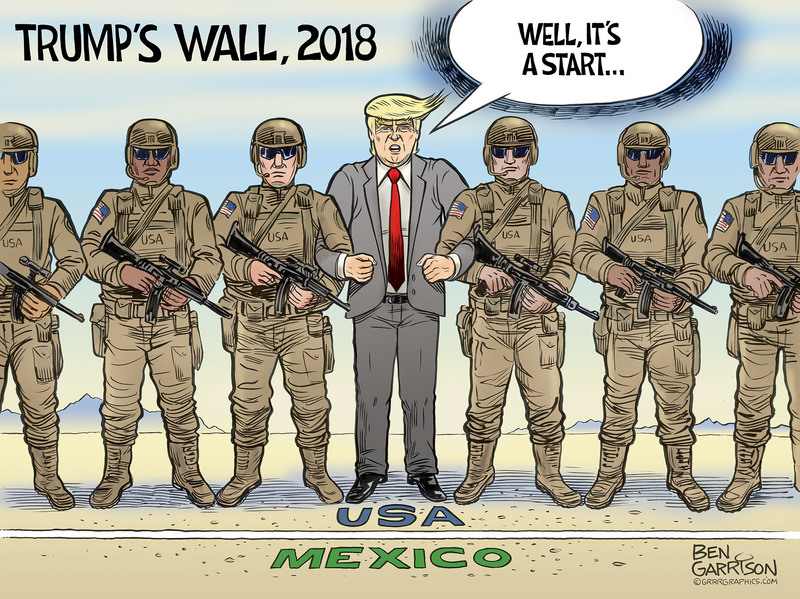 President Trump has the right and responsibility to use military force to stop this invasion. Geraldo Rivera had the gall stones to say, “What are you going to do if they won’t stop – kill them?” Well maybe we should seize them and crucify them along the border to discourage others of their ilk. More like we should do that with Geraldo for being such a scumbag as to suggest that’s the kind of people we are! This is how the left slanders and impugns America’s military. Isn’t it funny that the people who incite attacks cry oppression when Americans fight back? Isn’t it a crime when they who applaud killing millions of babies in the womb then call American soldiers “baby killers?” Which immigrants would want to sacrifice themselves to be martyrs for the Democrat cause? Without a doubt MS-13 savages would gladly execute women, children, and babies so the Democrats could blame their deaths on Trump. 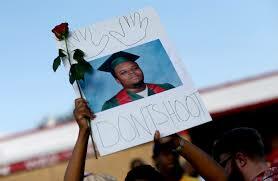 It doesn’t take deadly force to turn this army away, though that may be required for the more violent among them. Forcing their way across the Mexican border proved that this is not a peaceful band of refugees but an army of invaders. There will certainly be many criminals and terrorists among them using a few innocents as human shields. Those are the ones that need to be killed before allowing them into this country to prey on innocent Americans. If people like Geraldo want to help those in other countries, then they need to give extra taxes to go to those countries to help their people there. If he truly wants to help them then he’ll stop voting for Democrats to make their lives hell while inviting them to invade the USA to live as parasites off of the working American taxpayer! Democrats thrive on their moral equivalency. Neo-Nazi White Supremacists attack Black Lives Matter in Charlottesville and one of them is killed and it’s all reported as Republican’s fault! How does that happen when both groups are radical militant leftists created by Democrats? A group of Cubans harass Nancy Pelosi in a restaurant to make her reap what she has sown against Republicans and they become the only story in the MSM as a “Republican mob” molesting her. Why are these Democrat criminals not being charged for fomenting insurrection and inciting violence? Why are American laws not protecting people from this Democrat Thugocracy? There is no energy for people to vote for Democrats. They are proving to be the most vile, petty, wicked people in the country. The only votes they get are from America haters, brainwashed leftists, welfare parasites, criminals, foreign invaders, dead people, and liberal lunatics. Only Democrat voter fraud can save them while they claim Trump was elected by Russian voter fraud which is a colossal hoax! 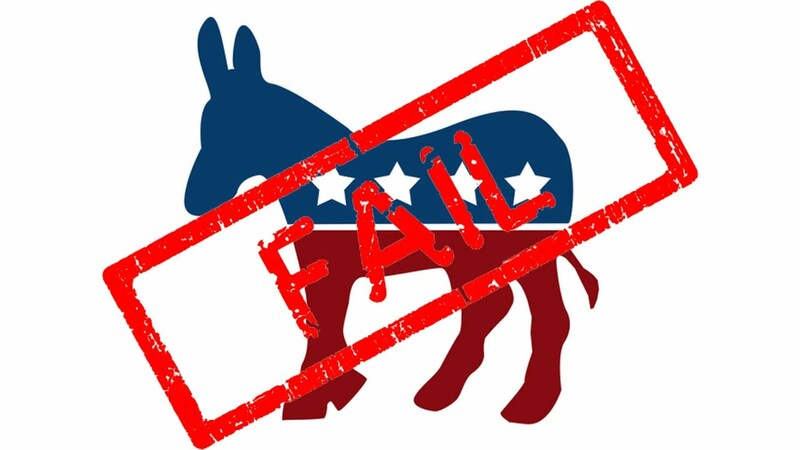 Democrats have lost over 1200 government seats since the election of their Moslem socialist to dismantle America and fundamentally transform the country into a “fair” socialist dictatorship. May they lose 1200 more starting this November with the Senate and House in Washington! 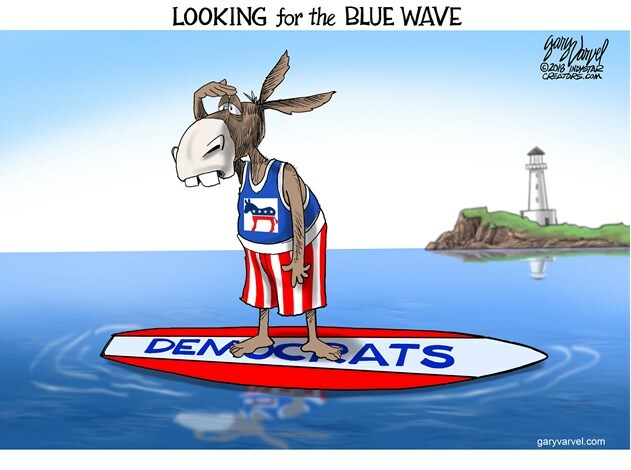 “So, what happened to this blue wave? What happened to it? Seriously! The Democrats have been out assuring everybody, promising everybody, everybody — the Republicans been scared to death. How many Republicans do you know? How many Republicans have you seen on TV the past month acknowledge they’re gonna lose the House? How many…? It’s every one of them, is it not, with rare exceptions! It ticks me off! I can’t hold back. Idiot lying leftists say Trump is the one inciting fear in this election because he can’t debate the policies? It is Democrat policies of assisting invaders and criminals that he is fighting. It is Democrat policies to mob and terrorize the people that he is fighting. There is not a question of who is inciting fear and anger in people. The left is guilty on all counts of using rage vs. reason. Trump’s policies are not based on irrational fears or fearmongering like Democrats. His are based on actualities. Democrats say Republicans suffer from Islamophobia and xenophobia? It is not a phobia when they’re really trying to kill you and steal from you. President Trump understands these people and how to fight fire with fire. He instinctively understands how to battle their propaganda machine and has the social strategic genius to expose and overcome them. America has a man who may be the greatest president in its history. He is Reagan, Lincoln, Washington, and Jefferson, Teddy Roosevelt, and Eisenhower combined, and he is here in America’s most desperate hour. Washington defeated imperialists, Jefferson beat back Islamists, Lincoln freed the slaves and kept the country united, Roosevelt defeated oligarchs, Eisenhower defeated the Nazis, Reagan beat down Communists, and Trump is fighting the left that represents all of those today. Democrats are hoping for a propaganda coup by which to slander Trump if and when some invading attackers get shot. Like Michael Brown in Ferguson, a thug who was shot dead by the policeman he was trying to murder with his bare hands, they will lift those dead up as victims of Republicans to make them heroic martyrs to their cause. Leftists dupe their indoctrinated liberals with their misinformation ploys and the only hope is that President Trump’s people stand strong against them to beat them back and educate them before they destroy this nation right out from under themselves. Democrats have nothing to offer in the era of Trump’s booming economy that they could never create, strong foreign policy that they abhor, and sound Americanism that they detest. All they offer is hate and rage and violence and deception to overthrow Americans to establish themselves as rulers. This entry was posted in Elections 2018 & 2020, Politics and tagged Americanism, Democrat terrorism, Donald Trump, Illegal Aliens, Illegal Immigrant Invasion, Socialism. Bookmark the permalink. By sending federal troops to the border, our president is doing the job that Barack Obama wouldn’t. Under Barack Obama, the entity that had a constitutional MANDATE to “provide for the common defense” (e.g., securing our border against a foreign invasion) was essentially forbidden to fulfill those duties. Without question, the millions of illegal aliens currently in the country without authorization constitute an “invasion;” AND, the violent crimes, theft and the fraudulent consumption of welfare, medical and educational services by these invaders certainly meets my definition of serious domestic and economic violence being perpetrated against American citizens. “Every sovereign nation has the authority to determine who can be a citizen and who can be present within its borders. As the nation’s former chief law enforcement officer, and a citizen who believes in the rule of law, I cannot condone anyone coming into this country illegally. We are a nation of laws. When people fail to follow the law with impunity, it encourages further disobedience and breeds disrespect for the rule of law; and that is not America.” — Alberto Gonzales, the nation’s 80th Attorney General, speech to the Austin Economics Club. WHERE THERE IS NO PENALTY FOR VIOLATIONS, WHAT BENEFIT IS ANY LAW?